A lone figure stands in an eerie green landscape with long beams of shimmering light seemingly emanating from his body. In another image, a neon-colored UFO spins above a muted creek at twilight. Though they seem impossible, these strange, surreal and otherworldly photographs were taken with a conventional camera and have not been digitally manipulated. 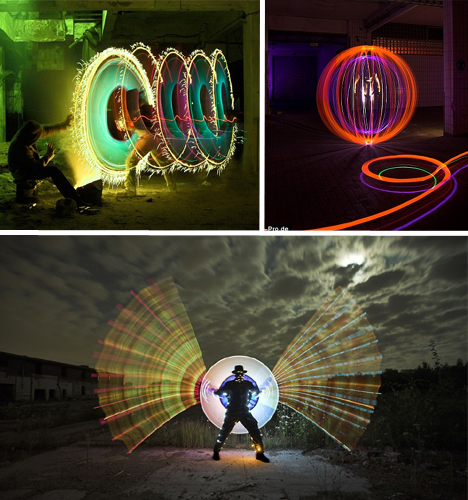 As fantastic as fireworks and creative as fine art paintings, these images are stunning examples of light graffiti, an art form in which light sources are used to ‘paint’ a picture, captured on film using long exposures and slow shutter speeds. 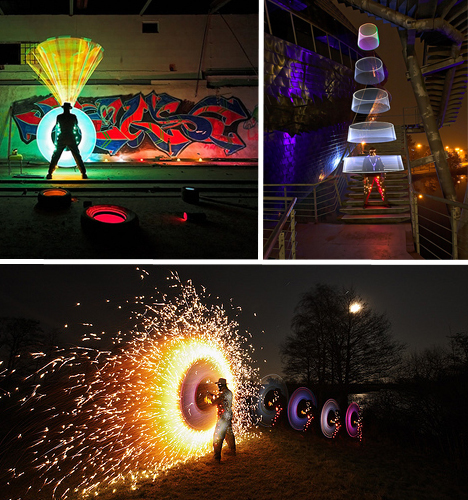 Light graffiti – also known as light painting – comes in a wide array of forms, from cartoons and creatures to shapes that highlight architectural details in urban environments. 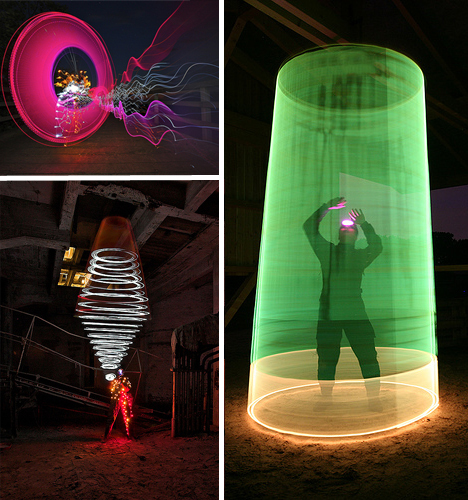 But these images, by German duo Jan Wöllert and Jörg Miedza of Light Art Performance Photography (LAPP), take that concept a step further, using light and a series of carefully choreographed movements to create complex forms. Many of the images created by LAPP consist of up to 20 steps, each designed to achieve a certain effect that contributes to the cohesive final image which is captured on a tripod-mounted 21.1 megapixel EOS 5D Mark II camera triggered with a remote control. Some of these images require exposures that go beyond 60 minutes. 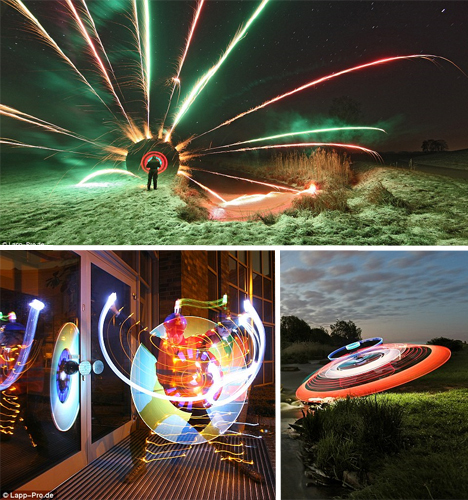 Miedza and Wöllert use fireworks, flashlights, light sticks and specially developed light tools to “draw” in the air while completing the choreography that will result in the final image. 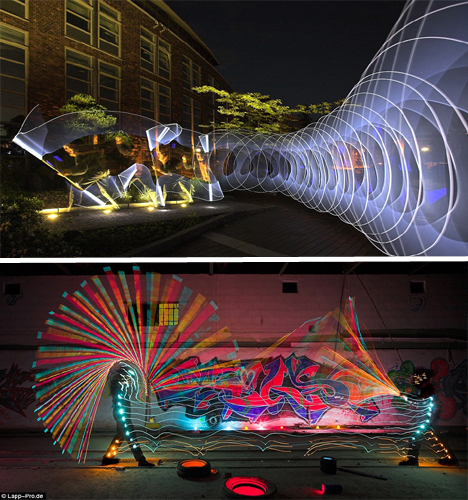 The duo describes their work as “the evolution of light drawing”. Wöllert dreams up their creative ideas while Miedza is the technical genius, figuring out which steps are required for the desired outcome.